I am speechless, nothing I can say will ever do justice to this piece of amazing craftsmanship! Rather than describe the ring I will give you an account of my journey in search for, what I consider the ideal masonic ring. This search began even before I was raised. I was looking for a unique ring that was original, elegant and understated but at the same time displayed the pride I feel in being a member of our fraternity. I had seen many many rings some new, some vintage but none of them really caught my attention until I saw Drew's designs. The dilemma I had was that I liked three different designs and I just could not make up my mind. I liked the simplicity of the Brotherhood Ring, the symbolism of the Vide, Aude, Tace Ring and the Square and Compass Mortality Ring but I just could not make up my mind. Then Bro. Drew began to show the concept of the Classic Signet Ring. This was exactly what I envisioned. He hadn't really started production when I first saw it and life got the best of my time and I forgot about the ring. 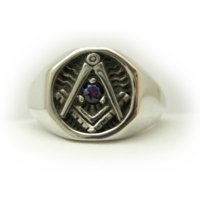 About a month ago, a few weeks before my 50th birthday, my mother calls me and says she wants to give me a masonic ring for my birthday and she wants it to be something that would be memorable and unique. I immediately knew what that was going to be. I sent her a link to this site and she also picked The Classic Signet Ring. I just received it yesterday and it exceeded all my expectations. In fact the entire process was a joy. I greatly recommend Bro. Drew's attention to detail in every aspect of the process and I particularly love my ring! Thank you for such wonderful craftsmanship and experience. I want to add that this ring (and soon "Kipling's Jewel") is worn by a Brother in the most easterly lodge in the USA, Washingtonn Lodge #37, Lubec, Maine! This is an addendum to my prior review. I spent a lot of time searching for a Masonic ring on line. I found nothing to compare to the workmanship or personal attention from the actual craftsman that The Master's Jewel delivers. Bro. Drew Horn's jewelry is solid, the presentation and delivery is personal and professional and his prices are very fair.